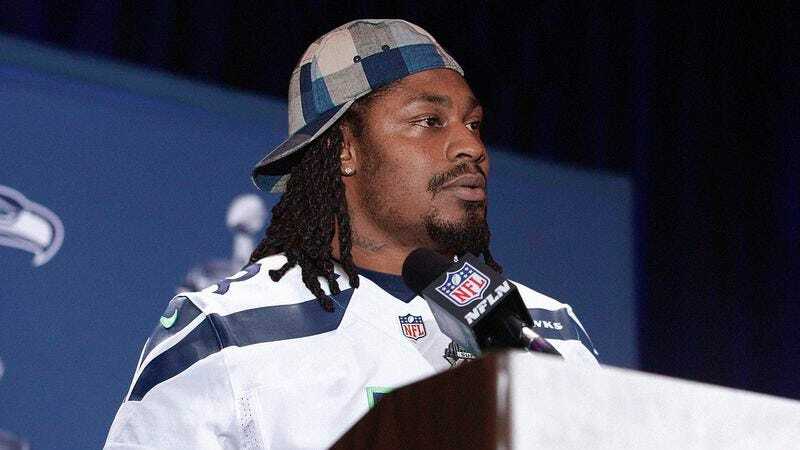 PHOENIX—Explaining his position on the sociological issue during a Tuesday press conference at Super Bowl Media Day, Seattle Seahawks running back Marshawn Lynch reportedly delivered an incredibly thoughtful and eloquent 45-minute address on the topic of privacy in the 21st century. “While increasingly exhaustive access to media has delivered many benefits to the American way of life, this same heightened scrutiny has simultaneously imposed progressively greater obstacles to our personal privacy, thus presenting ethical challenges unique to the internet age,” said the five-time Pro Bowler, calmly strolling back and forth with a microphone in hand while making eye contact with each individual member of the assembled national sports media. “Privacy versus accessibility; secrecy versus convenience; the individual versus the greater virtual communities of the digital landscape. At first blush, these appear to be the fundamental poles around which the modern privacy debate circles, but they have only grown more multifaceted and complex as the technological paradigm perpetually shifts. When meditating on the give-and-take of ever-evolving technology, I am often reminded of a quote from George Orwell: ‘Every generation imagines itself to be more intelligent than the one that went before it, and wiser than the one that comes after it.’ Could it be, in perhaps the ultimate irony, that with every technological advancement, with every marvel of engineering that seemingly brings us closer together and rips down the very walls that once divided the world, that with every such step forward, we have become ever more guarded about our own personal boundaries and the information we are comfortable sharing with one another? And in doing so, do we in fact chip away at the very core of what makes for a civilized society, and in an even broader sense, the very notion of being human? For to be human is inherently to be social, and yet it is also to desire control. With the public domain seemingly encompassing a greater and greater volume of personal information, that control has been ceded. The so-called right to privacy, as it were, is no longer a right inasmuch as it is now a privilege, to be enjoyed until it is torn away at a moment’s notice. Conversely, we so often desire to break down that same right to privacy of our fellow human beings, shielding ourselves while exposing others, just as a snake devours its own tail. Perhaps the biggest question of all is whether privacy itself—at least in the traditional sense—even exists in today’s world, or if it is simply a relic of a past time that bears no more meaning or significance than Aristotelian physics or the idea of a geocentric universe. Simple answers to such queries do not exist, I’m afraid, but in exploring them, we can at the very least hold a mirror to society and possibly even to ourselves—and that is something I hope to accomplish with all of you here today.” Following his lengthy treatise, Lynch stressed that he was only capable of delivering a cursory examination of such an extensive issue during his allotted time and urged those in attendance to contact him with any questions if they wished to discuss the matter in greater depth.